The Quanser QUBE™-Servo 2 is a fully integrated, modular servomotor lab experiment designed for teaching mechatronics and control concepts at the undergraduate level. Integrating Quanser-developed QFLEX 2 computing interface technology, QUBE-Servo 2 provides more flexibility in lab configurations, using a PC, or microcontrollers, such as NI myRIO, Arduino and Raspberry Pi. With the comprehensive course materials included, you can build a state-of-the-art undergraduate teaching lab for your mechatronics or control courses, and engage students in various design and capstone projects. The QUBE-Servo 2 experiment consists of a DC motor with an optical encoder, providing position and velocity feedback, a built-in amplifier with integrated current sensor, a data acquisition device, and a QFLEX 2 computing interface. The experiment comes with two add-on modules – an inertia disk and a pendulum. With a tool-less, quick-connect interface, you can easily attach the module, or remove it while the controller is running to observe the effect of different inertias on a controller response. Moreover, you can design and 3D print your own add-on modules to expand the scope of the experiment, or to create an engaging student project¹. The QUBE-Servo 2 also has a user-controllable tri-color LED strip. Users can program the LED to indicate state, power, or other control performance parameters of QUBE-Servo 2. QUBE-Servo 2 USB experiment, with QFLEX 2 USB interface panel, interfaces to Quanser’s control software running on your lab’s PC via a standard USB 2.0 connection. The QUBE-Servo 2 USB can be used with MATLAB®/Simulink® and Quanser QUARC software, or with LabVIEW™ using the Quanser RCP software. With the USB version of the experiment, you can take full advantage of the comprehensive course materials and lab experiments for your controls-based courses and projects. QUBE-Servo 2 Embedded experiment, with QFLEX 2 Embedded interface panel, interfaces to your microcontroller (not included with the experiment) via SPI connection. The QUBE-Servo 2 Embedded does not require any additional software. This option is ideal to expose students to various microcontroller techniques, as well as for final (capstone) projects in mechatronics, control, or other similar programs. Similar experiment – QUBE-Servo for NI myRIO allows for interfacing to NI myRIO embedded controller via MXP connection. The QUBE-Servo for NI myRIO is available exclusively from National Instruments. The QUBE-Servo 2 USB experiment comes with a mix-and-match, open source, rich digital media courseware, standardized for requirements of ABET evaluation criteria. The courseware topics are independent of each other, so you can build your own experiments sequence, and adapt the materials to existing course. The courseware also includes content for application labs, putting control concepts into the real-world application context. The QUBE-Servo Embedded experiment comes with examples of interfacing techniques and controllers (as Arduino sketches), as well as an interfacing datasheet detailing the connections and protocols used. 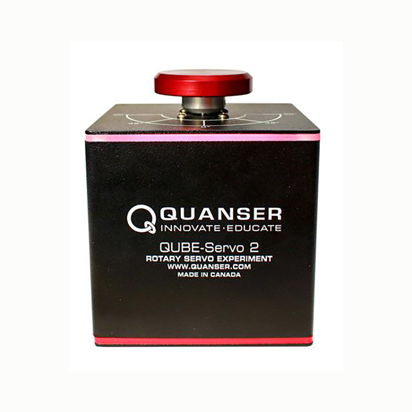 The courseware resources developed for QUBE-Servo 2 USB experiment are included for reference.